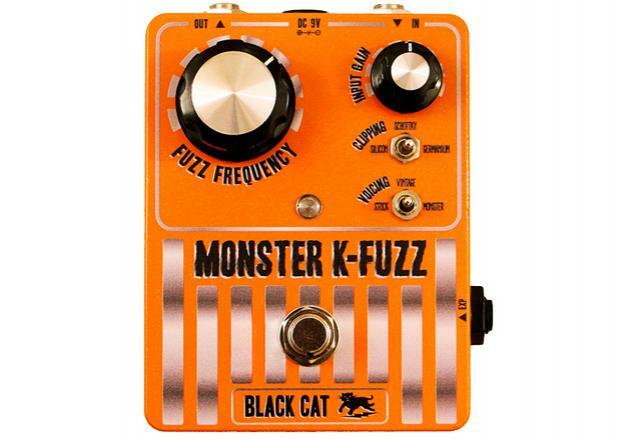 The Black Cat Monster K-Fuzz stompbox is the latest edition of our uniquely hotrodded version of the �60s Kay Fuzztone. The new Monster K-Fuzz stompbox has all the bells and whistles features of the treadle based version in a pedalboard friendly enclosure at a more affordable price. The Monster K-Fuzz controls can be set to go anywhere from a vintage Kay Fuzztone to a fire breathing monster fuzz. Expression pedal control of the Fuzz Frequency allows the same functionality as the former treadle based versions. And with a look that pays tribute to the �60s original, the new Monster K-Fuzz is the ultimate evolution of the Kay Fuzztone. Made in the U.S.A.